Brown University and Rhode Island School of Design (RISD) announce the launch of CoLAB: Innovations in Performance Practice, a three-week summer institute designed to incubate innovative performance and research practices. 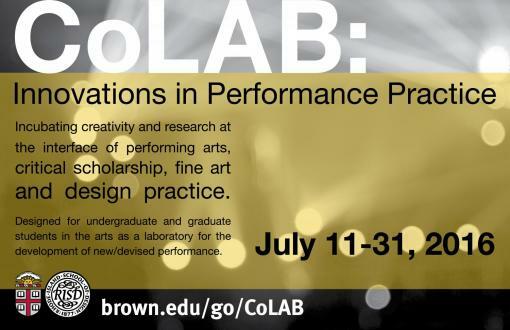 Providence, RI – Brown University and RISD this week announce the launch of CoLAB, a new summer institute designed to bring together graduate and undergraduate student artists in a laboratory environment for the development of new and devised performance. CoLAB is designed to create the conditions in which innovative performance and research practices can grow from within an interdisciplinary field of artistic exploration. With the support and mentorship of resident performance artists, visual and performing arts faculty, along with visiting artists and scholars, students are invited to investigate, expand, and create new models and approaches to live arts practice in an intensively collaborative program. CoLAB will function as a practice-based “think-tank” for the development of as yet unseen forms of expression in performance. Students will be immersed in an experience that is carefully crafted to offer them specific training in movement and staging, alongside classes that provide context for contemporary performance theory and practice. In addition, the program will offer guided workshops and mentored collaborative studio sessions. The public will be invited to participate in the development of participants’ creative process through a series of open studio showings of works in progress and critical feedback sessions. The program is hosting resident artists Gob Squad and Third Space Laboratory Theatre and is supported by teaching faculty including Emanuelle Deppich, Sara L. Brown, and Jenn Joy. Visiting scholars including Dr. Jennifer Parker-Starbuck, Wendall Harrington, Amelia Jones, and Narcissister will further enhance the range and depth of the program. Michael T. Williams and Fracesca Montanile will serve as teaching assistants. In 1920s Paris, and in the Greenwich Village of the 1950s, creative individuals seeking to challenge convention and make new work gathered in cafes and taverns. Artists living and working in these dynamic communities questioned the creative practices of their time, and their collaborations gave birth to radically new forms of music, art, literature, and performance. This is the environment we hope to re-create with CoLAB. CoLAB is focused on incubating creativity and research at the interface of performing arts, critical scholarship, fine art, and design practice. We will break down the barriers between “theater” and “performance” and between public and private space by interrogating the context of performance. Enrollment in CoLAB is by application. In addition to Brown University and RISD students, CoLAB welcomes applications from students at other academic institutions, as well as those who are not enrolled in academic programs but have an interest in the content of the course. No prior experience in performance is required. Applications will be reviewed as they arrive, but all materials should be submitted prior to May 15. CoLAB runs July 11 to 31, 2016 on the main campus at Brown University. For more information on CoLab and to apply, visit: www.brown.edu/go/colab.